Yes, ’tis the season for Messiah and The Nutcracker, but if you’re looking for something a little different, the intrepid folks at Jacaranda offer up this mix of music — some holiday-themed, some not — from Bach, Britten, Mahler, Tchaikovsky, Ives, Glass and more, this coming Saturday. Performers include Jonathan Dimmock (organist for the San Francisco Symphony), the Los Angeles Children’s Chorus, writer and raconteur Sandra Tsing Loh, and Cedric Berry (bass-baritone), among many others. He’s back, and there is much rejoicing. Most of you probably know about the three different programs over the course of seven concerts that E-PS will be conducting under the auspices of the Los Angeles Philharmonic’s “Lutosławski Centenary” celebration. Some of you might even know that during the first three of these performances, Sony will be recording the First Symphony as part of a future release of all four Lutosławski symphonies (the 2nd, 3rd, and 4th Symphonies have all been previously recorded for Sony by the E-PS and the LA Phil, and just for good measure, they also released a different recording of the 4th Symphony on DG Live). 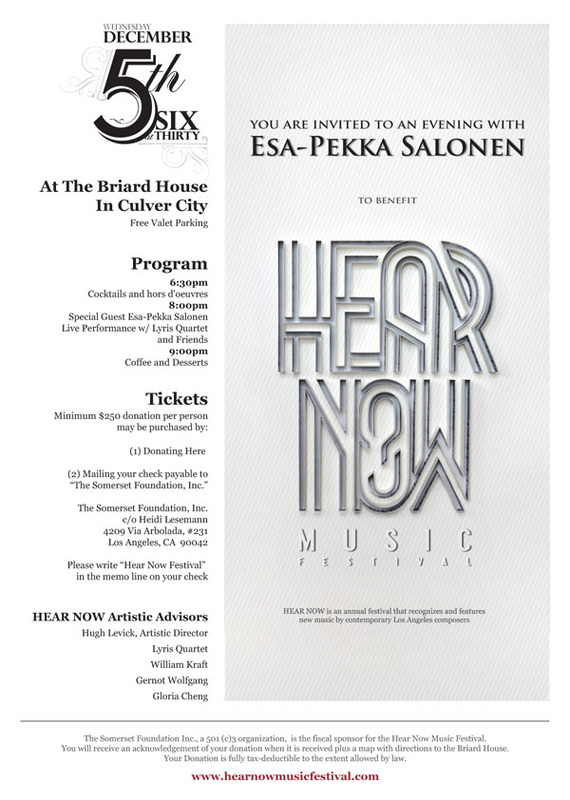 What many of you probably don’t know is that in addition to his appearances at Walt Disney Concert Hall, Mr. Salonen will also be appearing at Hear Now Music Festival’s benefit concert on December 5th at the Briard House in Culver City. The program features the Lyris Quartet performing two works the maestro selected for the evening — Stravinsky’s 3 Pieces for String Quartet and the Largo desolato from Lyric Suite by Berg with Elissa Johnston (soprano) — plus Alyssa Park (violin) playing Salonen’s own Lachen Verlernt. The maestro will offer commentary, and perhaps if someone plies him with enough beer and/or vodka, he’ll be convinced to also live tweet the concert (he’s certainly embraced the 140-character-at-a-time social network to help solve life’s little problems, so perhaps he’ll share this great event with the rest of us). For their two December concerts, our friends at LACO are pretty much avoiding any hint of the holidays and instead are embracing a different theme: Americana. Music Director Jeffrey Kahane conducts everything, plus does double duty playing the piano for Rhapsody in Blue (in its original 1924 version). Other works include Copland’s Appalachian Spring Suite, Son of a Chamber Symphony by John Adams, and Dvořák’s Serenade for Winds, Op. 44. The former first violin of the Guarneri String Quartet and current faculty member of the Colburn School Conservatory of Music is the headliner in this matinee concert. The program includes Mozart’s String Quintet No. 3 in C major (K.515), the String Sextet, Op. 85 from “Capriccio” by Richard Strauss, and the Dvořák String Quintet No. 2 in G major, Op. 77. For the first of their holiday classical concerts, Grant Gershon and his world-class chorus perform Christmas-time favorites by Baroque masters Vivaldi (Gloria) and Bach (Magnificat). Vocal soloists for both works are drawn from the Master Chorale’s talented ranks. If you prefer something a little more casual or perhaps songs sung in English, the LAMC perform two nights of Christmas Carols. And finally, if your Christmas is incomplete without a live performance of Handel’s Messiah, the Master Chorale presents two different flavors of the touchstone work: their fun sing-along version and a straight-up performance, with Elissa Johnston leading the quartet of soloists. Tags: Arnold Steindhardt, Bach, Britten, Esa-Pekka Salonen, Handel, Hear Now Music Festival, Ives, Jacaranda Music, Jeffrey Kahane, Lyris Quartet, Mahler, Vivaldi, Witold Lutoslawski. Bookmark the permalink.